The Alberta Advantage is about more than low taxes, Rachel Notley says, but also the services families need. 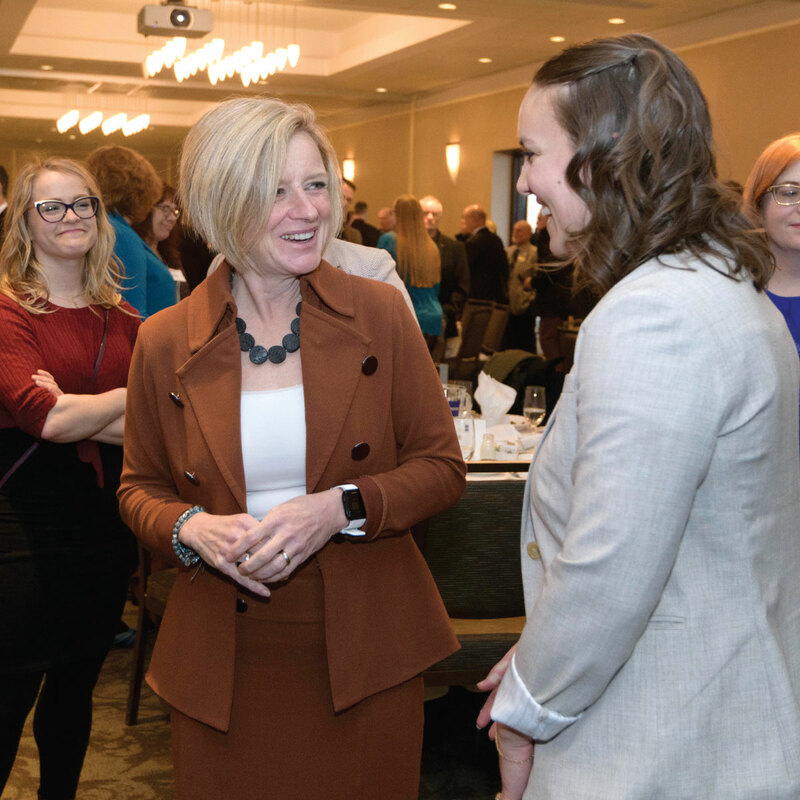 At a sold-out Edmonton Chamber of Commerce event, Notley promised a lunchtime crowd of more than 650 people that she will “keep Alberta’s $11 billion tax advantage secure” without gutting education and healthcare. Notley touted her track record of “common sense agreements” with labour groups, cuts to outrageous salaries and perks for executives on public boards, and ending the Conservative legacy of pork-barrel spending and backroom deals. Instead of building Sky Palaces, Notley says her government has built schools, not just announced them. To keep Alberta growing, Notley would refuse to bring in a sales tax, payroll tax or healthcare premiums. But she pulled no punches about the damage Jason Kenney could inflict on Edmonton. Notley pointed to Ralph Klein, who slashed thousands of public sector jobs in the early 1990s and left Edmonton in a decades-long slump. While Kenney has painted himself as Klein’s ideological heir, he has played coy about what he plans to cut. In an earlier address, Kenney told the chamber he would hold government spending to zero. Notley accused Kenney of soft-selling reckless cuts, failing to account for a growing population and expenses that won’t simply disappear. Had Notley pursued a ‘zero spending’ approach in 2015, 4,000 fewer teachers would be in Alberta classrooms. Notley said Kenney’s ideology would doom families to longer wait times, overcrowded classrooms, and an overall deterioration of services. The fight for Alberta’s future is a fight for schools and hospitals, Notley said. It makes little sense to cut education, a “huge strategic and economic advantage” for the province’s future, or health, the backbone of a workforce. While Alberta is still recovering from a downturn in global oil prices that began in 2014, Notley pointed to signs of growth and recovery. More than 100,000 new full-time jobs have been created, Alberta has led Canada in economic growth for the last two years, and nearly 800,000 people in the Edmonton area are working. Retail sales are up and new energy diversification projects are appearing around the city’s perimeter.